Ferrari is a luxury brand that we are proud to sell. With many great models like the Ferrari 488 Spider or the Ferrari 458 Italia, Ferrari has stolen the hearts of dozens of car collectors and luxury car enthusiasts. These vehicles are iconic for two things: their streamlined, athletic builds and their heightened performance specifications. Getting behind the wheel of a Ferrari vehicle every day will make you feel like royalty and with good reason. 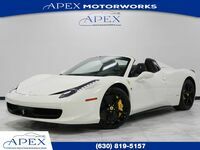 We are luxury vehicle enthusiasts ourselves here at Apex Motorworks, and our Ferrari vehicles hold a special place in our heart. We usually have a Ferrari vehicle or two for sale, but sometimes we can’t keep them from flying off our lot. Before coming in to our dealership, you can view our current inventory of used Ferrari vehicles by clicking the button below. Before you take a look at them though, we encourage you to stay with us as we explore the benefits of purchasing here at Apex Motorworks. Used vehicles are our specialty here at Apex Motorworks. There are many reasons to choose a used vehicle instead of a new one. For starters, they are discounted, but still have all the great features of a new vehicle. Plus, some used vehicles have extremely low mileage; you can even get a used vehicle here with under 10,000 miles, which means the vehicle is as good as new, but for a lower cost because much of the value goes away with a first-time purchase. Some benefits of purchasing a used vehicle here at Apex Motorworks include our large selection of used vehicles, our expert sales team looking to help, and the useful tools you can find on our website. We sell a ton of different vehicle brands, which means you can easily compare your Ferrari vehicles to your Porsche vehicles without traveling miles in between. Plus, our sales team will help make that comparing easy by getting you behind the wheel for a test drive and keeping you up to date with the latest brand information. Brand information can be found on pages like these. Furthermore, you can use our website to get online credit approval and do financial calculations, making your experience simple and all in one place. 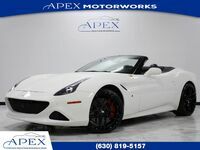 We hope you choose to buy with Apex Motorworks and make your next vehicle a Ferrari vehicle.